Does cryptocurrency have a carbon footprint problem? If you listen to the naysayers it’s clear that cryptocurrency is going to single handedly destroy the planet within a few short years. As with most things, the alarm bells on this new technology may be premature. Sure, there is a clear energy problem with some cryptocurrencies as they are now, but it is still early enough to identify these problems and deal with them before they take the whole planet down with them. Bitcoin was designed to have self-moderating growth, and one of the ways the programmers achieved this was to make miners solve increasingly complex problems in order to compete for the release of each Bitcoin that goes into the exchange market. This was a genius design on paper - as problems get more and more complicated and there are more computers vying for the new Bitcoin release by attempting to solve those complicated problems, the whole process gets slowed down so the market can’t get overblown with sudden releases of high volumes of the digital currency. Unfortunately the designers of this system failed to take energy consumption into account - all those computers doing all those complicated calculations take a lot of energy. What has ended up happening is that each new problem is taking as much as nine U.S. homes’ worth of energy for a day. Clearly this is a problem that cannot continue. There are lots of other forms of cryptocurrency that don’t have this kind of carbon footprint problem, but any currency that requires energy to use is going to have to face an energy audit sooner or later as the world steers away from fossil fuels. One mining operation in China is pulling energy directly off a hydroelectric dam, while another blockchain company bought all the land around Tesla’s gigafactory, which could end up being to power cryptocurrency from the renewable solar energy. 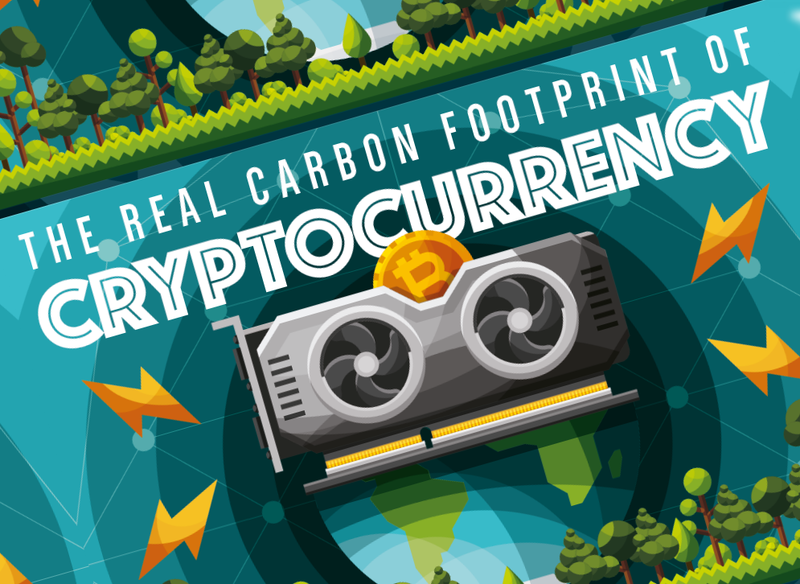 Learn more about cryptocurrency’s carbon footprint problem from this infographic.